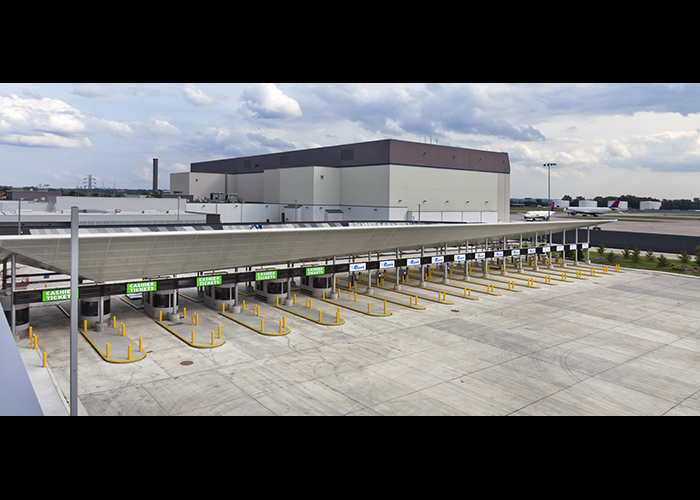 The MAC Parking Management Building & Revenue Control System project is a complete re-build of the Exit Plaza at the MSP International Airport. 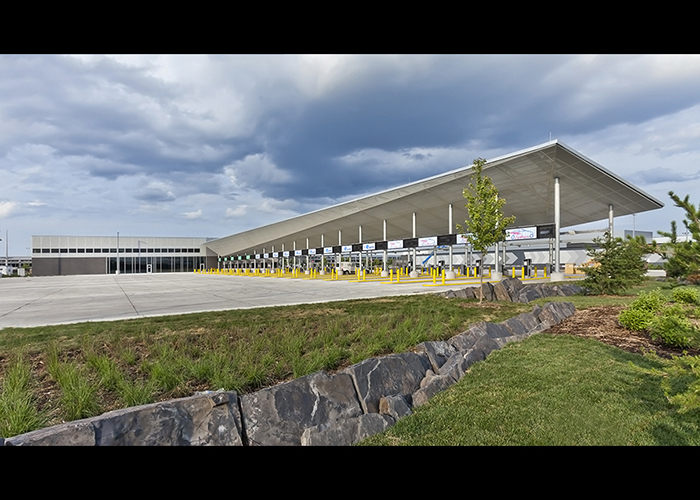 It includes a two-story multi-function office building and a 290 foot long, 48 foot wide partially-enclosed steel canopy over the exit drive lanes. The building is a steel braced frame structure on concrete drilled piers and a composite slab-on-deck floor and translucent panel, glass curtain wall and glazed brick facades. The canopy is a galvanized steel structure cladded with translucent panels on top and anodized perforated aluminum plating on the underside. 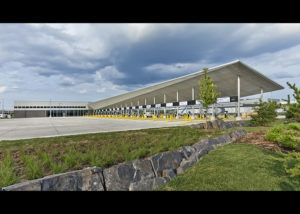 One of the primary challenges of this project was the unique geometry of the canopy and the owner’s desire for a very low maintenance structure. The design architect envisioned an extruded shape for the canopy that emulated an airplane wing. The top surface has a uniform slope, while the underside has six separate sloping surfaces intersecting along diagonal fold lines, resulting in a structure that has zero uniformity along its length. To accomplish this geometry while maintaining lateral stability, the steel structure consists of 27 unique trusses supported on moment frames in two directions, with in-plane bracing and internal sway frames. The HSS pipe columns have three-directional bolted moment connections to the girders that are canted to accomplish the slope of the canopy. 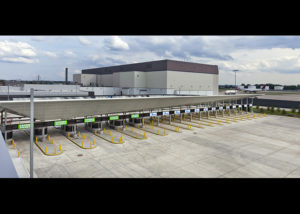 To keep the structure low maintenance, it is 100% hot-dip galvanized with shop welds and entirely field-bolted connections. An extra level of coordination and communication with the steel fabricator, erector, and special inspector was employed to minimize and resolve steel installation issues.